This imaginative mix of detective tale and Bible story begins with the narratives of ten Bible 'mysteries' followed by investigative questions to solve the puzzle and find the scripture's truth of each story. You get to follow the great detective's meticulous mind and follow him through the Bible, familiarising yourself with the Bible's environment and personalities as you go. 'The Needles Eye' can be read as an investigative novel or as a collection of individual Bible based detective stories. This a book that with something for readers from a very wide background - those who begin with Bible, those who love Sherlock Holmes and those who just love detective stories. The author captures the Victorian atmosphere of the original novels and leads you deeper into the world of the Bible with both a good yarn and an easy to follow Bible study. As Holmes says to Watson in the first of Conan Doyle's original stories: "It is a capital mistake to theorise before you have all the evidence. It biases judgement." This inventive and entertaining way to lead enquiring minds and lovers of a good detective story into the Bible helps you find the evidence, ask the right questions and draw your own conclusions to solve the Bible's biggest mysteries with a meaning for your life in the often baffling world of life today. Sherlock Holmes And The Needle's Eye by Len Bailey was published by Thomas Nelson in May 2013 and is our 6646th best seller. The ISBN for Sherlock Holmes And The Needle's Eye is 9780849964831. Be the first to review Sherlock Holmes And The Needle's Eye! Got a question? No problem! 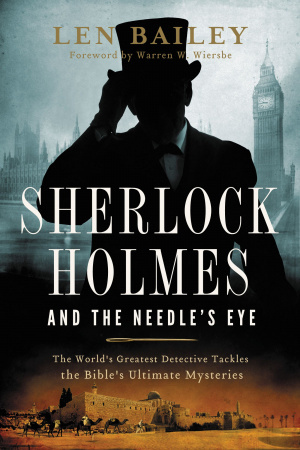 Just click here to ask us about Sherlock Holmes And The Needle's Eye.
? Why did Ahithophel hang himself?
? Is Zechariah the son of Berekiah or Jehoiada in Matthew 23?
? Why did David take five stones against Goliath?
? Why did Jesus delay coming to Lazarus in John 11? “You will especially appreciate the way Len has capture the ‘Victorian atmosphere’ of the original Conan Doyle stories, and as a bonus, you will learn more about your Bibles and how to study it successfully.” – Warren W. Wiersbe.